Fetch the list of all dashboards with the GET all dashboards call. Create a new dashboard with the POST a new dashboard call. Validate the configuration of a new dashboard with the POST validate a new dashboard call. Fetch the configuration of a specific dashboard with the GET a dashboard call. Update the configuration of a specific dashboard with the PUT a dashboard call. Delete a specific dashboard with the DELETE a dashboard call. Lists all dashboards of your Dynatrace environment, regardless of the access rights in the UI. A list of short representations of dashboards. A short representation of a dashboard. The ID of the dashboard. The owner of the dashboard. In this example, the request lists all dashboards of the mySampleEnv environment. The JSON body of the request. Contains parameters of the new dashboard. The list of tiles on the dashboard. The name of the tile. The type of the tile. The tile is configured and ready to use (true) or just placed on the dashboard (false). The position and size of the tile. A filter, applied to the tile. A filter applied to a tile. The management zone to which the tile belongs. The position and size of a tile. The vertical distance from the top left corner of the dashboard to the top left corner of the tile, in pixels. The horizontal distance from the top left corner of the dashboard to the top left corner of the tile, in pixels. The width of the tile, in pixels. The height of the tile, in pixels. The dashboard is shared (true) or private (false). How the dashboard is shared. If shared is set to false these settings are saved but not used. Filters, applied to the dashboard. Filters, applied to a dashboard. The default timeframe of the dashboard. The management zone to which the dashboard belongs. Sharing configuration of a dashboard. If true, the dashboard is shared via link and authenticated users with the link can view. If true, the dashboard is published to anyone on this environment. Configuration of a tile with an assigned Dynatrace entity. An example is the Bounce rate tile, showing the data from an assigned application. The list of Dynatrace entities, assigned to the tile. Configuration of a tile with the built-in custom filter. An example is the Service health tile, which may use a custom timeframe. The configuration of the custom filter. Configuration of the custom filter of a tile. It shows to which entity the filter belongs. Custom charts have the MIXED type. The configuration of a custom chart. A list of filters, applied to specific entity types. Configuration of a custom chart. A list of charted metrics. Additional information about charted metric. Additional metadata for charted metric. The timestamp of the last metadata modification, in UTC milliseconds. The color of the metric in the chart, hex format. Configuration of a charted metric. The name of the charted metric. The charted aggregation of the metric. Only applicable if the aggregation is set to PERCENTILE. The visualization of the timeseries chart. The type of the Dynatrace entity that delivered the charted metric. Configuration of the charted metric splitting. Sort ascending (true) or descending (false). The ID of the dimension by which the metric is split. The dimension is used for splitting (true) or not (false). Configuration of a tile with an assigned Dynatrace entity and an assigned metric. An example is the Worldmap tile, showing the data from an assigned performance or behavior metric of an assigned application. The metric assigned to the tile. Configuration of a custom chart tile. How the data is filtered for charting. Configuration of the Markdown tile. The markdown-formatted content of the tile. Configuration of the Browser monitor tile. Include (false&apos;) or exclude (true`) maintenance windows from availability calculations. Configuration of a User session query tile. The name of the tile, set by user. A user session query executed by the tile. The visualization of the tile. 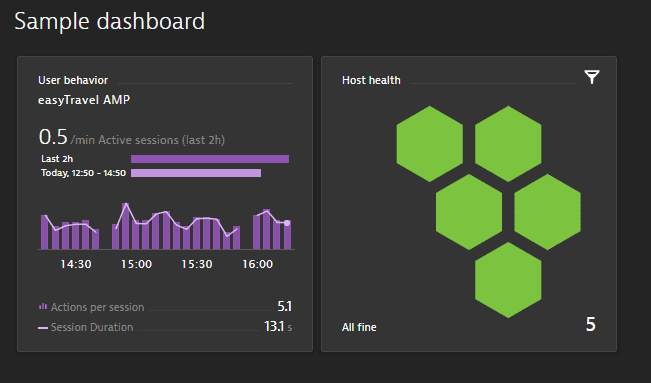 Configuration of the custom chart inside of a User session tile. The parameter, that is charted on the X axis. The parameter, that is charted on the Y axis. In this example, the request creates a new dashboard with the REST example name. The dashboard shows data for the Easytravel management zone in the time frame of last 2 hours. The dashboard contains just one tile—a User Session Query tile that queries for all user actions that, according to their Apdex status, are either tolerating or frustrated. You can download or copy the example request body to try it out on your own. Make sure to replace the ID and name of the Easytravel management zone to a management zone that exists in your environment or set this field to null. Validates the payload for the POST a new dashboard request. 204 Validated. The submitted dashboard is valid. The response doesn&apos;t have a body. In this example, the request validates the dashboard update for the POST request example. The response code of 204 indicates that the updated configuration is valid, so you can submit it to the environment. Gets parameters of the specified dashboard. The ID of the required dashboard. In this example, the request lists the parameters of the Sample dashboard, which has the ID of 2768e6ca-e199-4433-9e0d-2922aec2099b. The ID of the dashboard to be updated. The ID in the request body provides must match this ID. The JSON body of the request. Contains updated parameters of the dashboard. 201 Success. The new dashboard has been created. Response doesn&apos;t have a body. In this example, the request adds the Service health tile to the Sample dashboard in the GET request example. The tile shows the health of all services belonging to the Easytravel management zone. It is located next to the existing Host health tile and has the same size (304x304 pixels). You can download or copy the example request body to try it out on your own. Be sure to change the ID and name of the Easytravel management zone to a management zone that exists in your environment or set this field to null. Validates the payload for the PUT a dashboard request. This request has the same parameters with the PUT a dashboard request. In this example, the request validates the dashboard update for the PUT request example. The response code of 204 indicates that the updated configuration is valid, so you can submit it to the environment. The ID of the dashboard to be deleted. In this example, the request deletes the dashboard created in the POST request example. The response code of 204 indicates that the deletion was successful.